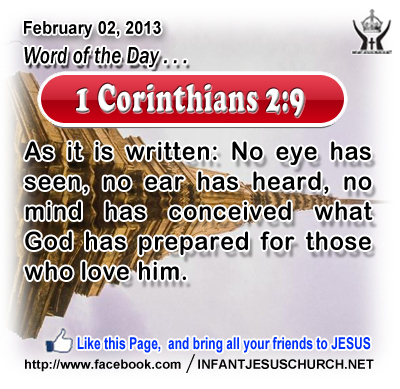 1 Corinthians 2:9: As it is written: No eye has seen, no ear has heard, no mind has conceived what God has prepared for those who love him. Heavenly Father, thank you for knowing us before time began. Thank you for crafting us in our mother's womb. Thank you for sending Jesus to pay the price for our sins. And thank you in advance for the day Jesus comes to take us home to be with you forever. Through Infant Jesus we pray. Amen. 22And when the time came for their purification according to the law of Moses, they brought him up to Jerusalem to present him to the Lord 23(as it is written in the law of the Lord, "Every male that opens the womb shall be called holy to the Lord") 24and to offer a sacrifice according to what is said in the law of the Lord, "a pair of turtledoves, or two young pigeons." 25Now there was a man in Jerusalem, whose name was Simeon, and this man was righteous and devout, looking for the consolation of Israel, and the Holy Spirit was upon him. 26And it had been revealed to him by the Holy Spirit that he should not see death before he had seen the Lord's Christ. 27And inspired by the Spirit he came into the temple; and when the parents brought in the child Jesus, to do for him according to the custom of the law, 28he took him up in his arms and blessed God and said, 29"Lord, now let your servant depart in peace, according to your word; 30for my eyes have seen your salvation 31which you have prepared in the presence of all peoples, 32a light for revelation to the Gentiles, and for glory to your people Israel." 33And his father and his mother marveled at what was said about him; 34and Simeon blessed them and said to Mary his mother, "Behold, this child is set for the fall and rising of many in Israel, and for a sign that is spoken against 35(and a sword will pierce through your own soul also), that thoughts out of many hearts may be revealed." 36And there was a prophetess, Anna, the daughter of Phan'u-el, of the tribe of Asher; she was of a great age, having lived with her husband seven years from her virginity, 37and as a widow till she was eighty-four. She did not depart from the temple, worshiping with fasting and prayer night and day. 38And coming up at that very hour she gave thanks to God, and spoke of him to all who were looking for the redemption of Jerusalem. 39And when they had performed everything according to the law of the Lord, they returned into Galilee, to their own city, Nazareth. 40And the child grew and became strong, filled with wisdom; and the favor of God was upon him. Not only Simeon was alone in recognizing the Lord's presence in the temple. Anna, also, was overflowing with the Holy Spirit. She was found daily in the temple, attending to the Lord in prayer and speaking prophetically to others about God's assures to send a redeemer. Supernatural hope grows with prayer and age! Anna was pre-eminently a woman of great hope and hope that God would fulfill all his promises. She is a model of holiness to all believers as we advance in age. Advancing age and the disappointments of life can with no trouble make us cynical and desperate if we do not have our hope placed rightly. Anna's hope in God and his promises grew with age. She never stopped to worship God in faith and to pray with hope. Her hope and faith in God's promises fueled her strong zeal and fervor in prayer and service of God's people. What do you hope for? The hope which God places in our heart is the desire for the kingdom of heaven and eternal life as our happiness. How do we grow in hope? By placing our faith in the promises of Jesus Christ and relying not on our own strength, but on the grace and help of the Holy Spirit. Does our hope and fervor for God grow with age? Loving Infant Jesus, may we never cease to hope in you and to trust in your promises. Fill us with your Holy Spirit that we may always recognize your saving presence in our life. Help us to point others to Christ and to be an example of faith and devotion as Simeon and Anna were to their generation.